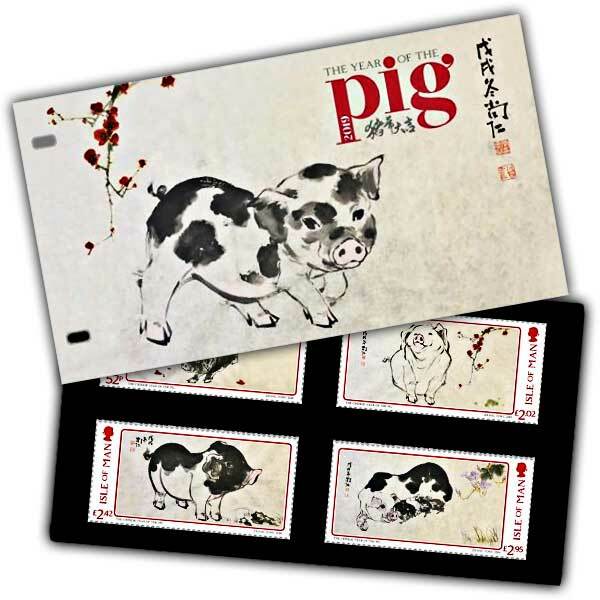 Inside the mini-folder awaits the beautiful, delicate set of four stamps, held within a black card carrier and the story of the Year of the Pig. The contemporary images used on the stamp designs were commissioned in collaboration with The Naughton group, a Hong Kong graphic design company and feature traditional colours including red metallic ink which is believed to be lucky in China bringing happiness and good fortune. In Chinese culture, pigs are the symbol of wealth. Their chubby faces and big ears are signs of fortune as well. Pigs also possess a beautiful personality and are blessed with good fortune in life. Recent years of the Pig are: 1935, 1947, 1959, 1971, 1983, 1995, 2007 and 2019.